Are you looking for a personal, dedicated club fitting experience with a certified fitter? Do you want more information on your swing and specs that can really improve your game? Are you looking for more options with shafts that are not available elsewhere? Austad’s new Tour Fitting Experience is for you. Before you would have to travel to Phoenix or Minneapolis for this level of service, but our stunning, custom-designed fitting studio in Sioux Falls, South Dakota makes this tour-level experience more accessible. The private space, separate from our main store, offers you an in-depth one-on-one experience with our top fitters. This unique golf experience is one you won't soon forget! Once you've booked a fitting in our Tour Fitting Studio, Austad's will assign a Master Fitter to your appointment. The studio itself is closed off from our 10,000 square foot golf superstore giving you privacy and the full attention of the Master Fitter. Inside the studio you'll have access to all major clubs/shafts. To ensure a relaxing experience, comfortable chairs, a stocked fridge with water, sodas and beer (for those over 21) and a flat screen TV is included in the studio. We want the atmosphere to be just right, allowing you to comfortably swing and be properly fit. Austad's Master Fitters go through a rigorous 3 stage certification process. They don't just fit, they teach. Austad's Master Fitters will walk you through our process, detailing what they’re looking for and why. Rest assured, our Master Fitters will get you in the right equipment to play better and have more fun! Cutting edge technology is vital to a proper fitting. Austad's has invested in Game Changer technology from Foresight Sports, the world's top fitting software for indoor fitting studios. Our Game Changer 2 "GC2" machines provide over 20 critical data points that our Master Fitters use to dial in the perfect specifications for your game. Additionally, Austad's has sourced an "HMT" attachment which takes 13 images of your club face through impact. This additional data provides our Fitters with the insight they need to help you play your best and most consistent golf. At the end of the fitting, our Master Fitters will print the Gamer Changer and HMT results so that you can be confident your new clubs will make a positive impact on your game. Austad's Tour Fitting Experience offers an incrediblee variety of additional shaft options for you to try. Often underappreciated, shafts are a critical component to your fitting. Austad's has numerous no-charge upgrade options included in the Tour Fitting Experience. If you are looking for something unique, we also offer a number of after market driver shafts not available in most retail stores. These premium shafts are an upcharge, though for serious players they can make a big impact on your game. Don't be overwhelmed by the 100's of shafts you'll see hanging in our fitting studio; your Master Fitter will make several shaft recommendations after evaluating your data. Austad's shaft expertise coupled with the best assortment of options will make your fitting a huge success. Custom Fitting is part science and part art. Becoming a Master Fitter takes time and dedication. You can be assured Austad’s fitters are some of the very best in the world. Our Tour Fitting Studio is located in our flagship store in Sioux Falls, South Dakota. The studio is a private fitting area, set apart from our 15,000 square foot retail store. What if I don’t want “all the extra’s”? No problem! Austad’s standard custom fitting is still available for you. You will have a certified fitter, access to all manfacturers products, and your cost of fitting, (while not as focused) is refundable with club purchase. Is this available at all Austad’s locations? 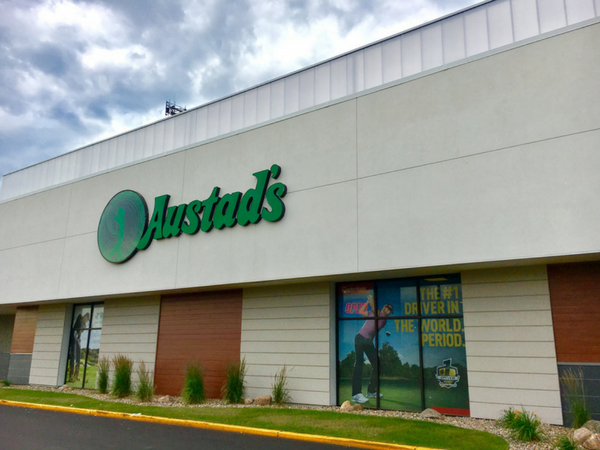 Currently, Austad’s Tour Fitting Experience is available only at our flagship store in Sioux Falls, SD. Our other stores all have the standard custom fitting available with certified fitters. That is somewhat up to you. While the standard fitting usually takes 20-30 minutes, the TFE process could take 90 minutes or more. We are dedicated to finding the right equipment for you. With one on one focus from our Master fitter, your time will be well spend. If I buy equipment, is my $100 cost refundable with purchase? No, the fee covers the extra personal time with a master fitter, access to our premium technology and the extra goodies like custom fit golf balls, a golf glove and beverages. Can I mix manufacturers in my set? Absolutely! Your fitter may find you have optimal results with a Ping driver, Callaway fairway woods, and Titleist irons. Every swing is different. The beauty of Austad’s Tour Fitting Experience is that we have literally all the best equipment available to try for you. Will I get my clubs the day of the fitting? No, your clubs will be custom made at the factory to your specifications. Usually you will have your new clubs within 2 weeks of the fitting. Do I need to do anything to prepare for my Tour Fitting Experience? We have found golfers who come in relaxed, loose and excited for the fitting process do best. Wear comfortable clothing, and be ready to hit a lot of balls. We will do the rest. We will even provide a new Foot-Joy glove. Tennis shoes work best. You will pay for your Tour Fitting Experience when you arrive for your appointment at our Sioux Falls location.